The message by Paul Karp was totally baseless and when I asked Mr Karp for specific details he would not respond. It was clearly part of a propaganda campaign run by Andrew Casey on behalf of the unions in the media room at the Trade Union Royal Commission. The abuse and defamation falsely claimed by Mr Karp related to his friend Andrew Casey who I outed in the last post as a Union Troll. The article I posted last week (24/9/14) is titled “The Bill Shorten Crew stalks and harasses witnesses and journalists at the Trade Union Royal Commission” (Click here to read the post) and I made a number comments on Twitter regarding Mr Casey and the post. The content of the Tweets on Twitter were calling Mr Casey a Union Troll, saying he is a lying grub and that he is going to jail. Hardly defamation and better than what he has called me in the past on Twitter. Being outed as a Union Troll seems to have upset Mr Casey greatly he has started a campaign to conceal the truth. 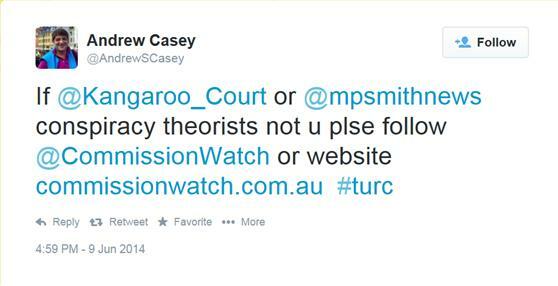 Mr Casey seems to have started complaining at the Royal Commission and on Twitter about how he had been defamed by me. But this is a lie as there was no defamation at all. The previous article names three people who troll the Royal Commission and try to influence the reporting etc. The three being Peter Wicks, Andrew Landeryou and Andrew Casey. I have written about Wicks and Landeryou numerous times before but it was the first time that Andrew Casey and his dodgy ways had been written about to my knowledge, except on Twitter by a few people. I’ll focus on two issues in this post. Firstly Paul Karp and his massive claim that he speaks for the whole media room and the false allegations that I had defamed and abused Andrew Casey. Secondly the fact that it is actually Union Troll Andrew Casey who has been bullying and harassing at the Royal Commission clearly looking for trouble. It was a big call by Paul Karp, claiming he speaks for the whole media room for which he has no power and a clear attempt to bully and intimidate me to shut up. I wouldn’t write about it except for the audacity of someone in the mainstream media (if you can call Thomson Reuters MSM) thinking they have power and authority over Bloggers. They don’t and that needs to be made clear in order that no one in the MSM ever tries it again. So let’s have a good look at the lies, deception and attempted bullying and also the fact that it was supported by the unions. The obvious problem is that I do not report to the media room or anybody in it. So at best it was extremely delusional of Mr Karp to make that statement as he is a nobody with no authority. But even if the whole media room did give Paul Karp authority who cares? Who are they? The Jedi Council? The reality is I know plenty of the people in the media room and I am sure most of them would not be impressed with Mr Karp’s Tweet and neither would their employers. I responded to Mr Karp’s bullying attempt straight away and said on Twitter “What defamation? Please be specific. And who exactly are you talking for in the #turc media room?” No answer. 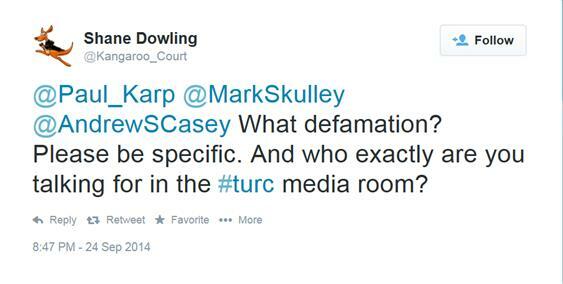 So an hour or so later I Tweeted “Mr Karp, you accused me of defaming Andrew Casey which is very serious. What defamation? Please be specific.” Again no response. I followed up with an email on Friday (26/9/14) (Click here to read). Still no answer, but he does seem to have taken down the Tweet after he received the email even though I did not ask him to. Like most bullies they run for cover as soon as someone stands up to them. 1. Mr Karp does not have authority to speak on behalf of the media room. What makes him think he does? 2. What motivated Mr Karp to make the Tweet? 3. Why did he take the Tweet down when I never asked him to? Why has there been no apology given he could not support the allegations in the Tweet? 4. Why has Mr Karp not responded to my Tweets and email? What will Thomson Reuters do? 5. Paul Karp follows Andrew Landeryou’s two accounts on Twitter, @Landeryou and @HSUcorruption, which are used for sleaze and smear and clearly defamatory attacks on witnesses at the Royal Commission and HSU members running in the current election, myself and others etc. So why does Mr Karp not say anything about the Landeryou sleaze, smear and defamation and support it by following Mr Landeryou yet complain about me calling Mr Casey a Union Troll. 6. Mr Karp specialises in Industrial Law reporting and understands bullying and would know what he did was clear attempted bullying. Like most bullies he needed support and that is why he said “I think I speak for all in #turc media room”. Why did he need to write that he speaks on behalf of all? Because he is a coward trying to intimidate. 7. So what Mr Karp was saying is that he speaks for all the journalists in the media room and he has made a finding of fact that what I said on Twitter was defamatory and abuse. Yet he won’t support those findings when asked by me on 3 separate occasions. 8. If Mr Karp was really unhappy with what I was saying he only had to block me on Twitter. Paul Karp has clearly got more questions to answer then above, but that will do for starters. It looks like Mr Karp has been coached well by his mate Andrew Casey. A career option for journalists who specialise in Industrial Relations is working for the Unions. Maybe that is what motivated Paul Karp. It’s hard to know as Mr Karp is not saying anything at this moment. Andrew Casey and his continued niggling. He encourages Landeryou to do his dirty work for him. I wrote plenty about Andrew Casey’s dodgy conduct, his career at the ACTU, CFMEU and other unions and the fact that he is trolling the Royal Commission on behalf of the unions / Labor Party in the previous post. (Click here to read) So I will focus on 4 examples of when Mr Casey showed his true colours openly. Three are Tweets as per below. 1. The Royal Commission started public hearings in May and the above Tweet is from the 9th June 2014. My Twitter name is @Kangaroo_Court and Michael Smith from the website Michael Smith News has the Twitter name @mpsmithnews and he also writes a lot about union corruption. What Andrew Casey is saying in the Tweet is that this website and Michael Smith’s site are both conspiracy theorist sites and if you do not want to follow them then follow another site called Commission Watch. Mr Casey is implying that I am crazy and/or delusional by calling me a conspiracy theorist. The Commission Watch site he recommends just happens to be a Union run website. When he uses my name in the Tweet I get an email telling me. So in one Tweet Casey insults me, lets me know he is insulting me, uses my name to help promote his Tweet and recommends a union run propaganda site. I thought about responding but did not bother. 2. The above Tweet is from the 21st of August and the day after I published a post titled “Bill Shorten uses internet trolls to try to blackmail & intimidate media reporting the Union Royal Commission“. (Click here to read) In the article I was very critical of Andrew Landeryou and the sleaze and smear campaigns he runs on Twitter. So what Mr Casey did in his Tweet above is send Mr Landeryou a message saying that I had written about him and that he should respond on Twitter. Andrew Casey knew full well that Landeryou would use his sleaze and smear tactics as per usual. So why does Andrew Casey encourage the sleaze and smear campaign by Landeryou? Landeryou was always likely to respond to my article but it was not for Casey to encourage it. I saw Mr Casey later that day and he said “Hello friend” and I replied “You ain’t my friend” in a rude tone as if to say, “Get lost, I don’t want to know you”. 3. Repeating what I wrote in the last post: “Andrew Casey jumped to Andrew Landeryou’s defence last Tuesday (16/9/14) in the media room in Melbourne. I was talking to someone in regards to Mr Landeryou stealing millions from the Melbourne University Union and Andrew Casey said aggressively words to the effect “I would watch what I say about that if I was you”. What I was saying has previously been well reported in the media (Click here to read) and it is not for any journalist to tell another journalist what they can and cannot say in the media room.” I said to Mr Casey words to the effect that he was nothing but a Union Troll and I would not talk to him and he should not talk to me. (to keep the peace in the media room). I asked Mr Casey on Twitter during the week: “Mr Andrew Casey why did you defend Landeryou in the #turc media room in Melbourne last week?” He would not respond. 4. Once again in the above Tweet Mr Casey is trying to stir trouble. It is worth noting he calls me a Troll, so how can he complain about me calling him a Union Troll. To sum up, Mr Casey attacks my website and calls me a conspiracy theorist, uses my site to try to promote a union site. 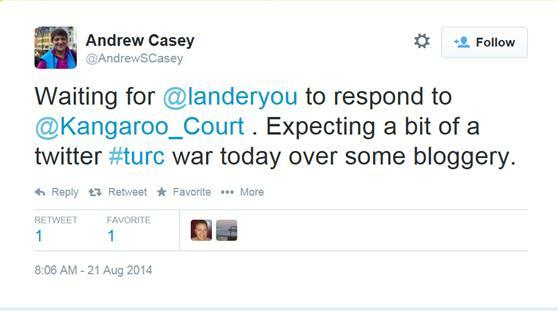 Mr Casey encourages Landeryou to attack me and my site and the sleaze and smear that Landeryou is known for. And Mr Casey continues with his games when I have made it clear I do not want to know him. 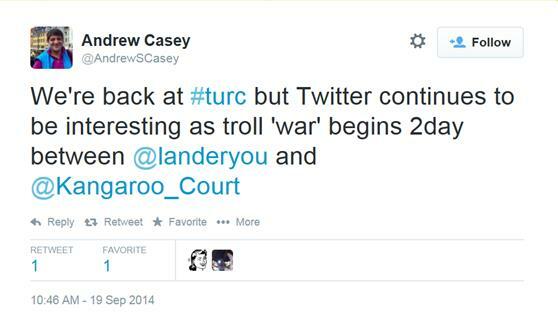 And when I out Mr Casey for being the Union Troll that he is he starts crying that he has been defamed. Mr Casey gets plenty of support from the Unions. Two of those who supported the Paul Karp Tweet are Mark Phillips ACTU New Media Editor & Editor of Working Life and Jackie Woods who works for Essential Media Communications. Ms Woods from what I can tell is working for the CFMEU (probably Crisis Management) as I believe I have seen her at the hearings shadowing CFMEU National Secretary Dave Noonan. Funnily enough Andrew Casey has written 7 articles this year for the “Working Life” website that the ACTU man Mark Phillips edits. I wonder if he is on their payroll given he was before for 10 years.. I could have let the Paul Karp Tweet slide and not worried about it as Mr Karp ran like the coward he is when I stood up to him. But the unions have supported him even it was to a minor degree which is consistent with the evidence of bullying by union officials regarding whistle-blowers that has been heard at the Royal Commission and that needs to be written about. This is a massive abuse by Paul Karp of his position as a journalist and he could have easily got away with it if the journalist/blogger on the receiving end had not been me, but some new and inexperienced journalist/blogger. So it also needs to be addressed to try to make sure such a disgraceful attempt of bullying never happens again. The unions have total contempt for the Royal Commission as the deleting of the emails by the CFMEU shows. So unions trying to bully the media at the Royal Commission is not surprising. If you would like to follow this site by free email notification you can at the top right of this page and about twice a week you be notified when there is a new post on this site. If anyone has been defamed or believe they have been defamed by you, they should take legal action against you, instead of asking you to stop. After all, I believe they all seem to have very deep pockets compared to yourself !!! Appears they have trouble answering researched allegations. Ahhh, just a schoolgirl spat. Nothing serious about it. Some of these media and union trolls are a bit precious when criticised. It always gives me great amusement whenever I hear someone say “I think I speak for all…”. I hope you didn’t lose much sleep over the comments of this buffoon! Sounds like a ‘murder’ of crows flying over ‘karp, karp, karp, karp’. Mr Paul Karp (probably thinks he is one of the admirable Big Fish) trying to bait people by niggardly, unreasonbable complaining! Why, that’s like the comical situation of a Carp fishing with Carp. We are grateful you are here reporting the facts that others are trying to cover up. Keep up the good work. Yeah, Shane I’d agree with most of the over comments herein all a bit of ‘blather’ from someone who thinks they’re a little bigger than they actually are ? Nevertheless ol’ boy, watch your back, OK ? Whether or not is a witch hunt is one thing but it is certainly not a waste of money as far as I am concerned. But no one can really say until we see what comes of the Royal Commission’s findings and recommendations. A witch hunt by whom? Most of the people giving really damning evidence are union people that still have some sense of ethics and busines people that have suffered under the others. And it didn’t need a Royal Commission to discredit trade unions, they have managed that themselves over many years of crime and corruption. You want a RC into dodgy politicians? Well since every Labor polly is a card carrying union member I think you might find you are getting your wish. Shane there was another Chris Brown/Kitching/Williamson press release published by Brad Norington in the Oz today. No mention made of the damning wiretap transcripts aired in the last 2 weeks or previous VICPOL investigations of these matters. The flimsy thesis today seemed to be that before Jackson was a whistleblower she wasn’t a whistleblower. Norington couldn’t continue this campaign without Chris Mitchell pushing. What is the Oz up to? Has Mitchell come to an accord with Shorten? just a typical bully, use some genuine Australian language, tell them to get knotted!! In any event one cannot believe the media pack anymore. There are so many mixed messages here, well———–this guy in the bush just has to take yourself on trust. So where do we go with all of this. I know Mr John Dyson Heydon is very, very smart, but his report will have to be put through the ringer. Regards.